Providing marriage and family therapy (MFT) can be highly rewarding work that allows practitioners to help couples and families resolve conflicts, enhance their ability to communicate with each other, and establish healthy dynamics. The practice of MFT also involves a unique set of circumstances that can pose challenges for providers, namely, that the provider’s professional obligations extend to multiple individuals. It is therefore essential that as an MFT, you understand the ethics standards of your profession. This course blends didactic material with interactive exercises to help you to stay on top of recent changes in MFT ethics by reviewing relevant ethics standards, discussing issues and trends, and giving you opportunities to test your knowledge. 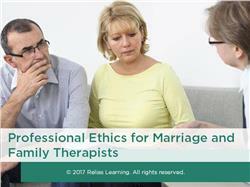 The content for this course is based on the standards of the ethics code of the American Association for Marriage and Family Therapy (AAMFT), updated in 2015. Additionally, bear in mind that as you review the course material, while the term “marriage therapy” is used throughout in keeping with the verbiage of the ethics code, the issues discussed also apply when working with unmarried couples. The course material also applies to MFT practice when providing services to families and to clients seeking individual counseling to address their relationship issues. This activity is approved for 2.25 contact hours. Clinical supervision courses may only be used to satisfy CE requirements for individuals who are already Board-Approved Supervisors. They may not be used to meet the 30 hour requirement found in minn. Rule 5300.0160. Summarize the specific ethical responsibilities MFTs have to clients and the profession. Explain the applicability of the ethics code to your work, and the relationship between ethics codes and laws. Identify specific ethical pitfalls that can occur in practice and describe proactive steps you can take to prevent them. Frederick M. Martone, PhD., is a licensed psychologist and licensed MFT. He completed his Masters degree at Duquesne University and his doctorate from California Graduate School. He completed pre-doctorate work at Los Angeles Department of Mental Health, and post-doctorate work at California Department of Mental Health Camarillo State Hospital. He is licensed in the state of California. He has experience teaching graduate school, working in private practice, as a psychologist for the Los Angeles County Department of Mental Health, in non-profit residential, foster care, non-public schools, and as psychologist for the State of California Department of Corrections and Rehabilitation. Primary areas of focus include assessment, individual and family psychotherapy, consultation, and supervision. Disclosure: Frederick M. Martone, PhD has declared that no conflict of interest, Relevant Financial Relationship or Relevant Non-Financial Relationship exists. The target audience for this course is: entry, intermediate, and advanced level Marriage and Family Therapists; in the following settings: Health and Human Services.